My recently released book, Ghosts of Jim Crow: Ending Racism in Post-Racial America offers a prescription for moving America beyond its destructive race problem once and for all. Many believed that the 2008 election of Barack Hussein Obama, America's first black president, proved the country had moved beyond race. Statistics have proven otherwise. Seventy-five percent (75%) of whites graduate from high school compared to less than 60% of blacks. Black unemployment, poverty, and homelessness are twice that of whites. Wealth accumulation for blacks is one twentieth of what it is for whites. Understanding how deeply entrenched race discrimination has been since the country's formation may explain why racial inequality continues. From the 1806 Hudgins v. Wright case where free blacks were racially profiled, presumed to be slaves, and denied their due process rights simply because they were black to the 2013 People v. Zimmerman case where allegations of racial profiling committed by George Zimmerman, a white neighborhood watch volunteer, against Trayvon Martin, a black teenager walking home, delays in Zimmerman's arrest and prosecution after he shot and killed Martin, and controversy surrounding Zimmerman's acquittal, suggest race remains divisive. Ghosts of Jim Crow notes the three distinct eras, the nation's founding, Reconstruction, and the civil rights movement, in which progress towards racial equality was marred by periods of resistance and retreat. Colonial talk, in the latter 18th century, of building a new nation on the principles of liberty and equality meant little to the millions of blacks forced into chattel slavery. At the end of the 1800s, the promise of emancipation following the Civil War was cut short when the Supreme Court adopted a "separate but equal" theory of constitutional equality in Plessy v. Ferguson. In the decades following Plessy, weak enforcement by federal officials of anti-discrimination laws, in the face of massive resistance to desegregation initiatives by many state and local governments, allowed Jim Crow segregation to flourish. This remained true even after such behavior was ruled unconstitutional in Brown in 1954. In the late 20th century, just as the civil rights movement was beginning to show results through race-conscious affirmative action programs adopted by government and private entities in school admission and employment hiring, the Supreme Court limited the government's ability to redress all but the most blatant examples of discrimination. Currently, there are two types of racism that prevent equality – structural racism and cultural racism. Structural racism involves policies, laws, and programs that embed inequality within the entities of our society, and in so doing, reinforce cultural racism, those beliefs and actions that embrace racial hierarchy and isolation. Both structural and cultural racism must be ended in order to create equality and allow for integration. Legislative and judicial responses to continuing racial inequality have been inadequate. Not only should laws prevent discriminatory treatment, they must also ensure access and opportunity. Subtle, yet pervasive, racism, through presumptions of black inferiority and embraces of black separation and white isolation continue to prevent such progress. One example is evident in employment disparities. Unemployment among blacks consistently remains twice that of whites. In difficult economic times, black women are hit particularly hard: In the recent recession, the percentage of jobs lost by black women was higher than any other group. Bari-Ellen Roberts understands this phenomenon all too well. A black woman employed as a senior financial analyst at Texaco in the 1990s, she was denied opportunities for professional advancement by supervisors. Ms. Roberts, who sued in a class-action discrimination suit, wrote about her experiences in "Roberts v. Texaco: A True Story of Race and Corporate America." Another example is found in disparate sentencing, exemplified in the story of Tim Carter and Richard Thomas, arrested in 2004 in separate incidents three months apart in nearly the same location in St. Petersburg, Florida. Police found one rock of cocaine on Mr. Carter, who is white, and a crack pipe with cocaine residue, on Mr. Thomas, who is black. Both men claimed drug addictions, neither had any prior felony arrests or convictions, and both men potentially faced five years in prison. Mr. Carter had his prosecution withheld, and the judge sent him to drug rehabilitation. Mr. Thomas was prosecuted, convicted and went to prison. Their only apparently difference was race. 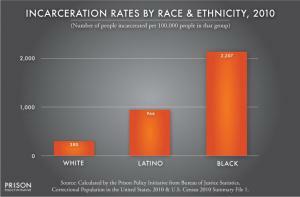 Incidents like these contribute to the alarming statistic that blacks are imprisoned at more than five times the rate of whites. A third example is "Tipping point" bigotry, which inspired Jeremy Parady, who pleaded guilty in 2005 to conspiracy, to commit arson in a series of fires in a new housing development in Southern Maryland. Parady, who is white, admitted that he set fire to the development because many of the buyers were blacks and the surrounding neighborhood was mostly white. The approach of simply eliminating government racial classifications will not create racial equality. We must eliminate notions of superiority to stop the cyclical process whereby racist thoughts and actions lead to disparities. Three things must happen in order to destroy both structural and cultural racism. First, we must recognize that inequality due to racism continues. The eye cannot see what the mind does not comprehend. Next, blacks must become empowered educationally, politically, and economically to eliminate the disparities in graduation rates, electoral representation, and employment. Legislative initiatives like the American Jobs Act, that target residents of areas of high unemployment for job creation and training, can help facilitate such empowerment. Similar legislation can be drafted to address political and educational disparities. Blacks can tackle the paradigm by valuing education and other legitimate vehicles for upward mobility. Too many black youth have turned to gangs, drugs, crime and hopelessness. Finally, we must integrate and equalize schools, neighborhoods, and the criminal justice system through legislative initiatives that balance funding for education, criminalize private racial discrimination and end racial profiling, and increase diversity efforts in housing. Without such changes, racial inequity and division will continue. With such changes we can rid American society, once and forever, of the ghosts of Jim Crow. F. Michael Higginbotham is the Wilson H. Elkins Professor of Law at the University of Baltimore School of Law. Though legislative solutions and attempting to change our own views are good steps, we must confront something which inundates us with ideology: the media. Whether it's a television show or a news broadcast, non-Caucasian races are displayed in a harsher light. Racist jokes and commentary that are regurgitated in the media are not okay, though their prevalence would say otherwise. Fixing depictions of blacks and other minorities in the media is not a sole solution to the problem but it is a step in the right direction, especially for those whose perspectives are solely shaped by material that they watch and read.